Episode 1 of BBC Three’s Killer Magic aired last night to huge acclaim and a worldwide trend on Twitter. If you missed Chris blow the mind of Joe Swash by turning him into a real life pac-man then you could feel sad. Or you could watch it again thanks to the wonders of YouTube. 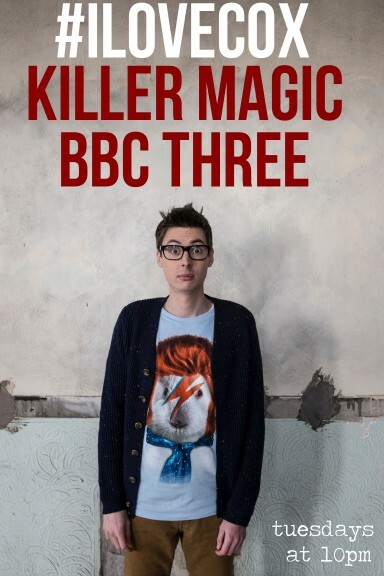 On Tuesday 24th March and 10pm Killer Magic starts for a six week run on BBC Three. Make sure you’re watching what The Sun have called one of the most talked about shows of the week. Find out more on the BBC Three website. Blink and you’ll miss him, but Chris really does appear in Killer Magic which starts very soon on BBC Three. The trailer is now here for your viewing pleasure and the air date will be revealed very, very soon.